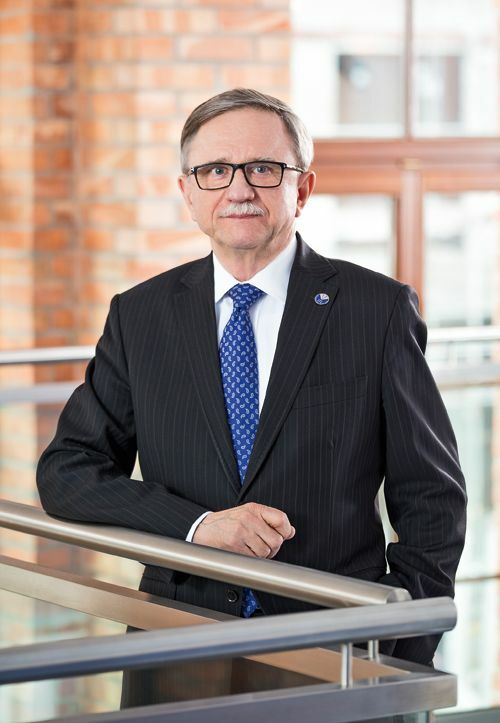 Rafał Ostrowski, ‘Eurobuild CEE’: What's the latest about Port Praski? Adam Pykel, CEO, Port Praski: We’ve just completed two more buildings – at ul. Okrzei 6 and 8. These have a total of 170 apartments, which their first residents already have access to. A building at ul. Sierakowskiego 4 with 300 apartments is still under construction. It’s now at the lock-up stage and will be completed later this year. Is it going to be one of the largest buildings in Stara (Old) Praga? Krzysztof Pykel, investment director, Port Praski: Yes, it will. 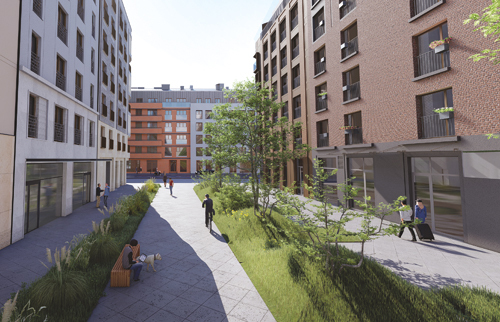 But it fits into the neighbouring development because we have divided it into smaller units with separate entrances so that it resembles a line of tenement houses. We don’t want Port Praski to be a huge residential ‘dormitory district’, but to have a typically urban or downtown layout. We are aware that buildings in cities are designed by many different architects, so we also try to ensure that every building is designed by at least a different team of architects if not by another studio. So what is lying on designers’ desks now? KP: At the moment we are finishing the design of three more residential buildings. Two of these, at ul. 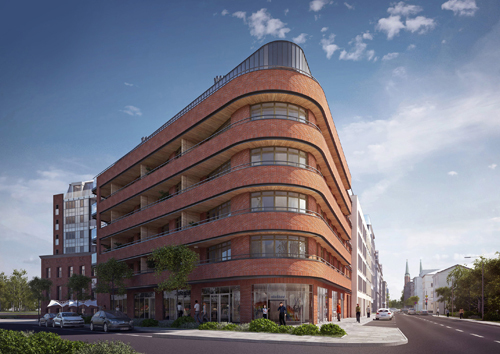 Sierakowskiego 1 and 3, are being designed by the Danprojekt studio, while the other, located on a new street, is the work of the APA Wojciechowski studio. After the completion of the design work, which will be a matter of weeks at the most, we intend to apply for the building permits and then enter the sites sometime this year. In all it comprises 300 apartments. This year we will start selling a total of 500 apartments. Are you also planning to develop the first office building? AP: Actually, it will be our second one, since the current headquarters of Port Praski have already been built, on ul. Krowia. We also hope to start the construction of this new office building this year. It will have an area of around 40,000 sqm. Have you secured any tenants yet? AP: The building is fully leased. In fact, we are constructing it for a single tenant that will occupy the whole building. All the buildings that you’ve talked about so far are in Stara Praga. When do you intend to complete the construction of this part of your project? 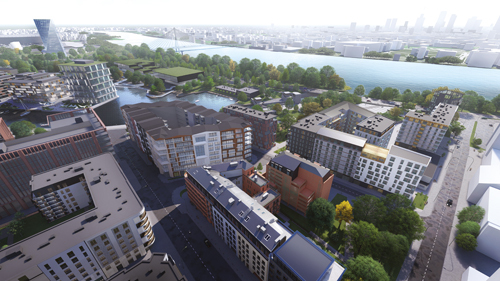 KP: In 2022, we would like to complete the entire first part of Port Praski, in the Stara Praga neighbourhood. This is a total of around 1,000 apartments, along with the office building and a five-star hotel on the corner of ul. Okrzei and ul. Sierakowskiego. This will be created through the renovation of an existing historic building as well as the construction of a new building. AP: In 2022 we hope to have completed a third of the next area of ​​Port Praski – Doki [the Docks]. At the moment, the concept is being drawn up for four residential buildings and a 30,000 sqm office building on the eastern pier, along ul. Wrzesińska and ul. Zamoyskiego. When this has been completed, we will announce an architectural competition and then apply for the building permits. These will be residential and service buildings. Service facilities will be on the ground and first floors. The entrances will be on ul. Wrzesińska and ul. Zamoyskiego, and there will be a wide boulevard along the docks on the other side of the buildings. KP: On the central pier there will also be a wide boulevard. Anyone who lives in Warsaw will be familiar with the pedestrianised street of ul. Chmielna in the city centre and they will know that cars also have access to it and it sometimes seems as if they’re going to run over some of the pedestrians. So we’ve decided that what would be good for our project is to put the entire road system underground. This will be a closed underground tunnel that will provide access to the buildings along the central pier. AP: We will definitely start the construction of the wharf this year. Porr and Keller are finishing drawing up the detailed design for this. They should be able to start the construction work this year, probably at the end of April or early May. This year we will also finish the construction of the flood defences, which will provide full protection from flooding for the 400,000 or-so inhabitants of both Praga districts. This is probably the first case when a section of the city’s flood defences has been built by a private company with its own money. And this comes to several million złoty. However, the re-development of the docksides depends on being granted environmental permission. But isn’t Port Praski still waiting for this? KP: That’s right. This has been going on for several years. At the beginning, we divided the entire area of ​​Port Praski into six parts and then applied for environmental permits for each of them. At the moment we only have these for Stara Praga, while we are still waiting for permits for the docks. We have already carried out all the surveys and obtained all the expert opinions required, as the authorities requested. The final decision, therefore, is up to them. But we have to bear in mind that there have some unexplained refusals of projects in the past. I think in our case this will come to an end when an appeal is lodged with the local government appeal court, since the same thing happened when the flood defence project was being prepared. KP: Yes, our ‘City’ section. This will feature four skyscrapers. The tallest will be 160m in height and the three others, which will have a common base, are to be 140m, 120m and 100m. A shopping centre with direct access to the metro is also planned and has been included in the study. At the moment no final decision has been taken as to how big the centre will be. The City area will also include a school, a hospital, a multipurpose hall and another high-rise building with a viewing platform. The final part of the project: the media and conference centre near the Wybrzeże Szczecińskie embankment together with a cable car service across the Vistula, is also awaiting a decision from the council. But it seems that this probably won’t be given the green-light? KP: Why not? If there’s a cable car in Wrocław and in Prague in the Czech Republic, in Lithuania and even in smaller towns, why can’t one be built in Warsaw? Wouldn’t it be a problem for river navigation? AP: No, it wouldn’t. On the opposite bank of the river there is a high slope near the Copernicus Science Centre. Therefore the cable car would be very high above the river and would not interfere with its navigation. So are the costs too high, then? KP: No. This does not require a huge investment at all. There are many companies in the world that could do it and we are talking to one of them. The costs are less than constructing several kilometres of cycle path. Then what kind of costs are we talking about exactly? KP: We don’t want to talk about this yet because it’s not the right time and everything could change. In fact, everything is in the hands of the authorities. The carriages will be expensive, but they will also be cheaper than other means of transport. When Wrocław mayor Rafał Dutkiewicz opened the cable car service in his city, not so many people wanted to use it at first. But that was before everyone saw how quickly you could get to the other side this way. So it’s something that will attract tourists and will be a very cheap investment. What might be the biggest problem with this scheme? AP: Of course, it requires the involvement of the city, because we are neither the owners of the river nor of the other side of the Vistula. The city would have to provide access to the area and share the costs of the project – if it makes such a decision at all, of course. We were talking about doing this a few years ago. A conference centre is also planned next to it that will also exhibit the latest televisual and telecoms tech. We started planning both projects at the very beginning. When could this investment see the light of day? AP: The construction of the cable car could be completed three years from now. If we can come to an agreement with the city, and we believe the council can be persuaded to come onboard at some point, I believe this connection could be incorporated into the public transport system, as has been done across the world. As I’ve said, everything depends on the decision the authorities eventually take as well as on the environmental assessment and permits we are granted. According to some media commentators, after the completion of Port Praski – and we have to remember that the entire project covers 38 ha – the centre of Warsaw will shift eastwards. Is that also your view? KP: In actual fact, it’s difficult to pinpoint exactly where the city centre of Warsaw is or which part deserves to be called that. Not everyone, I think, realises that the distance from Port Praski to pl. Zamkowy [Castle Square] is almost the same as from the square to the Bristol hotel. It should be pointed out, however, that the layout of Port Praski will be very coherent. Everything will be at your fingertips – the residential section, the office part, the sports and entertainment hall, the school, the media and conference centre, the hotels, the retail and services, the cinema and the theatre. And it will also be convenient to get to from the rest of the city because of the two metro stations and the cable car across the Vistula. AP: Take Hamburg as an example. You get to the harbour and everything you need is just a stone’s throw away. Importantly, though, we are also creating an open neighbourhood for all of Warsaw’s residents. Adam Pykel has been the CEO of Port Praski since 2011. He has more than 40 years of experience in managing domestic and foreign construction projects having gained his experience working for a number of commercial enterprises, construction firms and state companies. In 2007–2011 he acted as a consultant for a team working on amending the construction and spatial development law, responsible to the Deputy Minister of Infrastructure for Construction. Adam is an expert in water and hydrotechnical construction. He graduated from the Warsaw University of Technology. Krzysztof Pykel has been the investment director of Port Praski since 2013. He has worked in international real estate market for many years. He studied at the Warsaw School of Economics, the University of Warsaw and the University of Catania.